Yeshua (ye-SHOO-ah) or Yahshua, comes from Yahweh and is the Hebrew name for Jesus. Jehovah, Yahweh, Yeshua, Yahshua, and Joshua, all came from the tetragrammaton of YHVH. Yeshua means "YHVH saves" (Matt. 1:21) The name Yeshua comes from Joshua's Hebrew name, Yehoshua (יְהוֹ ֻשׁ ַע) which sometimes appears in its shortened form, Yeshua (e.g., 1 Chron. 24:11; Neh. 8:17). Yehoshua also means "YHVH saves or delivers”. 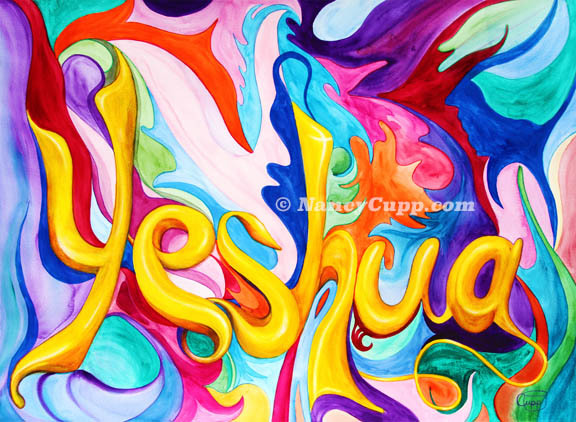 The first letter in Yeshua is “yod” which has a “y” sound in Hebrew. When Yeshua is transliterated into Greek it comes out as Ἰησοῦς (Iēsous) (pronounced YAY-soos). In old English, the letter “j” had the “y” sound we use today. In early English Bibles they correctly pronounced the Hebrew pronunciation, using today’s Y sound, but spelled it with a J. As language shifted over time, the spellings did not keep up with the Hebrew pronunciations. Yeshua evolved into what sounded like Yaysoos in Greek and spelled in English as Jesus. Whether you use Yeshua (Hebrew) or Jesus (English), there is no other God able to save us.